There are so many people we meet here who touch our lives and offer their trust and friendship so that their child has an opportunity to receive medical help. One very special kid is Fernand0–he certainly has a special place in our hearts. 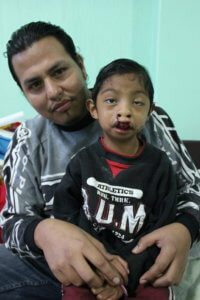 Fernando’s father, Ricardo, is a nurse at a private hospital in Guatemala City. He grew up in Huehuetenango and his mother and ther family still lives here. 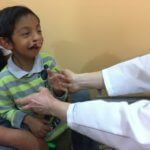 Fernando first came to the Iowa MOST clinic when he was a toddler. The team was able to do one lip surgery at that time. 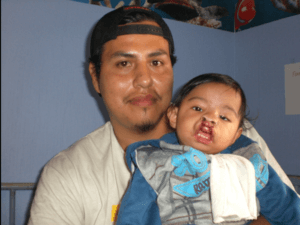 The next year when Ricardo brought his son back to the clinic, the screening revealed a heart condition that needed to be addressed so no further surgery could happen during that trip. The following year, after Fernando had received medical care in Guatemala City for his heart condition, father and son returned again for a third year to be disappointed when a bad cold and congestion prevented the team from performing any further procedures. Team member Nienke Berkhoudt and Fernando on screening day this year. 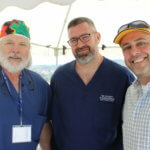 Surgeons Dan Jorgensen, Brian Andrews, and Ross Zbar. For those who have gotten to know father and son, it is no suprise that Ricardo was determined to come back again the following year. During that screening, everyone was delighted when Fernando was cleared for surgery. 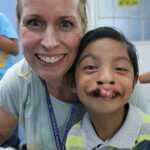 During that visit, the team performed a dental extraction and repair to the left lip. During this visit, Fernando was again cleared for surgery and the 2018 team performed a tooth extraction, repair to the right lip, and surgery on half of Fernando’s palate. Surgeon Ross Zbar performed the surgeries this year and last. Fernando and the Anesthesia team on Screening Day. There are more surgeries ahead for Fernando as the team continues to work on his palate and see how much the pre-maxilla shifts with continued surgeries. Much will depend on how Fernando’s teeth “erupt” or come in, and what condition they are in. Medical Team Leader John Canady notes that they have discussed future care with local orthodontist and Rotarian Rita Morales. Ricardo with Fernando in Post-op this year. When I talked with Ricardo, he emphasized his confidence in the Iowa MOST team and their continued concern for the safety and well-being of his son. That faith is well-placed since everyone on the Iowa MOST team adores Fernando and is dedicated to helping him have the best possible future.